Down East Orthopedics maintains patient privacy in compliance with the Health Insurance Portability and Accountability Act (HIPAA). Our physicians participate with most insurance carriers. Patients will be responsible for paying their insurance co-payments, deductibles and any self pay balances at the time of their visit. Payment arrangements can be made by contacting the office prior to your visit or at the time of your appointment. Many insurance carriers require a treatment authorization prior to your being seen by one of our orthopedists. These authorizations/referrals must be completed by your Primary Care Physician prior to your visit with us. If you do not have an authorization from your insurance carrier in may cause you to endure a higher out of pocket expense. Please contact us for help regarding this matter. Our physicians perform services at Eastern Maine Medical Center, St. Joseph’s Hospital, and DOWNEAST Surgery Center in Bangor. When you receive care at any of these places, the bill for your doctor’s services will be separate from the bill you receive from the hospital. We maintain a complete electronic medical record on each patient. All information contained in your medical record is treated as confidential material and will only be released to your treating and referring physician. A signed written release must be completed & faxed to 207-942-5631 if you want your medical information sent to any other parties. 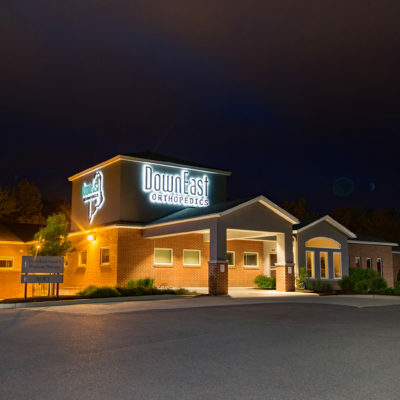 If you are going to become a new patient at Down East Orthopedics and feel other providers have records that may be helpful to your appointment with us, please print one of our Medical Release Forms to forward to your provider. The release form along with your records can be faxed to 207-942-5631.